Have you ever felt invisible? Like you don't matter? That you can go days, weeks, or even months without interacting with another human being? Well, that is how Ellen Homes feels, until one woman comes along to change all that in ways she never thought possible. Ellen is just going about her normal routine of observing her neighbors, eating junk food, and working the overnight shift at Costco. Having been shamed over her physical appearance and with no one caring about her, Ellen has found ways to make herself invisible and she's quite comfortable living this way, with only a cat for company. One day Temerity, a young woman who is blind, sits next to Ellen on her bus ride to work. Intrigued by her friendliness and outrageous sense of fashion, she follows her off the bus and ends up saving her from being mugged. Soon, Temerity and Ellen form a close friendship and go about involving themselves in the lives of others. Now that Ellen isn't so invisible anymore, will she become comfortable with her new lifestyle, knowing she actually matters to someone else...even if that someone can't even see her? 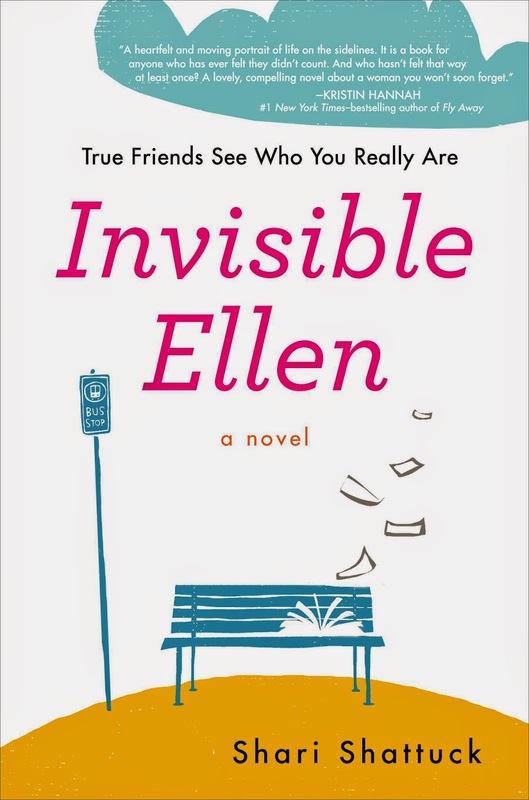 Invisible Ellen isn't your average chick lit novel. However, it has had an impact on me that only happens every once in a while from a book. It is such a heartwarming and uplifting story about friendship and the effects it can have on one's life. When Ellen and Temerity first became friends, it reminded me of how I felt when I first became friends with certain women I am still close with now and the natural high I got after hanging out with them. Aside from Ellen and Temerity, there were a lot of interesting characters who came in and out of the story at different times. I loved seeing what the two women would come up with next to change their lives in some way. Going along with this were some really funny moments, as well as poignant ones. While most of the characters and settings were easy to visualize, I wish that we had been told which city Ellen lived in. I kept picturing New York, but am under the impression that Shari would want it to take place in L.A., since she lives out that way. The apartment building Ellen lived in would have been easier to understand in terms of layout, had there been a picture to accompany it. Either Ellen had supersonic hearing, or the windows of her neighbors were incredibly close. I also would have liked to know Ellen's age. I know Temerity was in her 20s, but Ellen could have been anywhere on the age spectrum. There were some coincidences that seemed a bit forced, making other parts predictable, but that didn't detract from my enjoyment of the story. I just kept wanting to see what would happen next. A few weeks ago, I participated in #HugABookWeek on Twitter and Facebook. 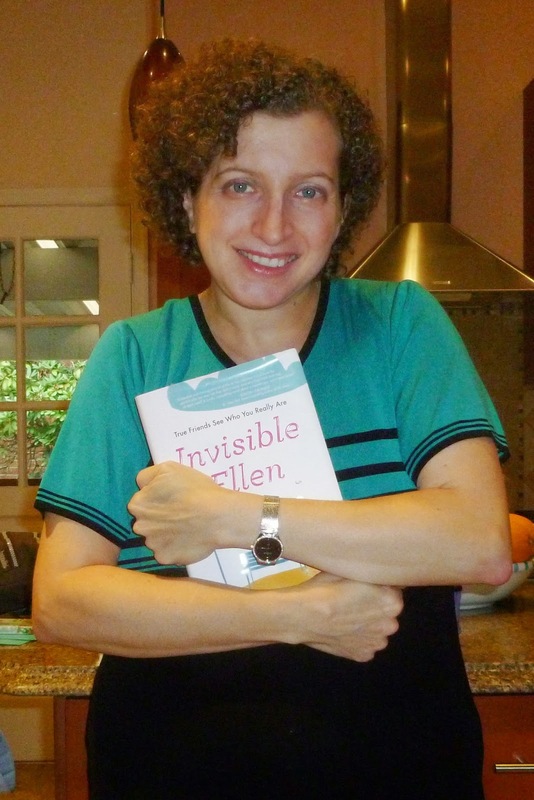 I happened to be reading Invisible Ellen at the time and it was just the perfect book to hug. I didn't even want to let it go when I had turned the last page. It has definitely made it to my 2014 favorites list, as well as my all-time favorites list. I can't seem to stop recommending it! I know there's a sequel coming and already can't wait to get my hands on it! I don't really have any casting ideas, but when I picture Temerity, she looks like Tatiana Maslany when she plays Cosima on Orphan Black. I could even see their personalities being the same. Thanks to Putnam for the book in exchange for an honest review. They have FIVE copies for some lucky readers in the US and/or Canada. And Shari Shattuck has offered ONE of the winners a one-on-one Skype chat! Please tell us: What would you do if you were invisible for a day? US/Canada only. Giveaway ends October 7th at midnight EST. This sounds like a fabulous book. I often feel like Ellen, invisible. The friendship she makes with Temerity sounds like one we all wish for. This book is definitely on my "must buy" list. If I were invisible for a day, truly invisible, I would find the most normal person I could and follow them around for a day just to see if there really is such a thing as normal. Sounds like an awesome book! I would wonder around Washington, DC...beautiful city...lots of excitement...see what it is like to be President! I think I would go to the White House and just observe! Sounds like a great read. If I were invisible for a day, I would love to follow my 2 girls around school all day. I want to know how they are behaving when I am not around and to see how they are treated by others. I am so worried about the mean girls and want to make sure they can handle themselves. I would probably go rob someone lol! If I were invisible for the day, I would just have fun I think. It would be hilarious to scare people by driving invisibly, taking things off shelves, etc. I like watching people; so, being invisible would allow me to observe some people more closely without them being aware. The book sounds great and I'd love to read it. I guess it depends on where you are when you are invisible. If you are in your home town, I don't know that it would be any fun at all. I already know people are pretty strange here. If I was in Hollywood (just up the road a bit), I could follow a few stars around and see how they really act. If I was invisible, I would want to tour homes of some of the rich and famous and see exactly what life is like for them. I'd just sit and read a book, and nobody would disturb me! I would hide away with a book and read all day and take a nap where no one could find me. No interruptions for a whole day! Wonderful. I read this book and thoroughly enjoyed it. The winner is going to be very happy and well entertained. I saw this book and B&N and it is on my TO READ list. Sounds really quite good. I think that if I were invisible for a day, I would go to the White House and follow the president. Hmmmmmm...invisible for a day...I would go to some of my favorite bakeries and watch how they made my favorite treats! Hmm, if I were invisible, I'd probably follow John Krasinski. I would love to pele watch and see what people do when they think they are unoberved. I have this book on my Kindle and loved it. I recommend it to everyone. I'd really like a hard copy as it is now one of my all time favorite books. I'd listen to conversations that I shouldn't be listening to. If I were invisible for a day, I would spy on successful people to see what their secret is in life. That way I could put it into action and see if it works for me. I think I would sneak around my family and friends and see what they say and do when they don't think I am there! Okay, I'm sold. It sounds divine! If I were invisible, I would follow my kids around in school and see what they were like in that environment! If I were invisible, I would probably love to mess with my two dogs and see how they would react! If I could be invisible for one day, I'd follow my niece around on her college campus to see how she's really doing ... to make sure she's alright. She says she's "fine," but I'm worried she's overloaded herself with too many courses and pressure, so I'd like to get the REAL scoop and SEE for myself. This sounds like a delightful story! Ooh, if I were invisible for a day? That's a really great question. I think I would create havoc for anyone who was mean to me. I would love to be invisible for a day. Think of all the things you could find out about people, how they really are when nobody is watching. If I could invisible for a day I would not want to follow around any of my friends or my spouse. It would seem too much like invading their privacy. But, I would want to follow my kids to see how they interact in their world. I guess I would want to get a little reassurance of my parenting skills. If I was invisible curl up &read. I would haunt people! It would be so fun! I would watch my dogs when they were alone in the house. I just want to know what they do all day while I'm at work! Thanks for participating and telling us what you'd do if you were invisible for a day! I like the idea of following your kids around at school. I'm inclined to do the same! Thanks to Putnam for sharing this book and to Shari for offering a Skype chat to one of the winners.